The National Assembly voted Monday to fast-track a vote on the government’s controversial bill on higher education, also known as Lex CEU. In a 115-49 vote, the assembly approved a request for an emergency parliamentary procedure, and will vote on the bill before noon on Tuesday. 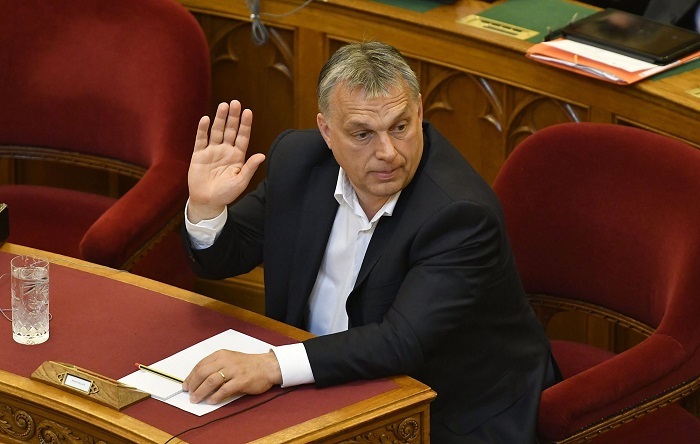 Prime Minister Viktor Orbán (pictured above) voted in favor of the expedited procedure. The emergency procedure precludes a detailed general discussion of the bill in Parliament. Instead, MPs will have three hours on Monday, until 5.04pm, to submit modifications to the bill. Those proposals will be discussed as the first agenda item in Tuesday’s session, immediately after which a vote will be held. The bill does not appear likely to be evaluated by any relevant governmental educational bodies. Use of the emergency procedure is limited to four times per parliamentary session. Fidesz’s initiation of the procedure indicates an exceptional urgency by the party for the passage of the Lex CEU bill as international condemnation intensified over the weekend. Opposition parties the Hungarian Socialist Party (MSZP) and Politics Can Be Different (LMP) requested the postponement of discussions on the bill on Monday, but were denied by the majority. In the likely case of its approval, the bill will have been rushed through Parliament and passed as law in less than a week, during which time civil organizations, governments, opposition parties and grassroots resistance movements around the world have strongly demanded its withdrawal. A protest march in Budapest on Sunday attracted an estimated 10,000 people, many of whom voiced demands for academic freedom in Hungary. Representatives of shuttered universities in Russia and Turkey spoke at Sunday’s rally, offering solidarity with CEU. Senior Fidesz politicians have argued that the bill does not specifically target what they call “Soros University.” But several elements of the legislation uniquely affect the university, leading critics to believe the bill is only the latest step in the Orbán government’s attacks on Soros-connected organizations in Hungary. A bill was reportedly leaked on Sunday which would require NGOs that receive foreign funding to register themselves with Hungarian authorities, similarly to legislation currently employed in Russia and Israel. Fidesz officials have consistently mentioned organizations such as the Hungarian Civil Liberties Union, the Hungarian Helsinki Committee and Transparency International as Soros-tied organizations that would best be “swept out” of the country, and the leaked bill is regarded by critics as the legal remedy to the government’s Soros problem. Additionally, a new round of “national consultation” questionnaires appeared in mailboxes over the weekend, which pose six questions to Hungarian voters. In the questionnaire, titled “Let’s Stop Brussels!”, two questions refer to international organizations as threats to the safety and sovereignty of Hungary.